Sanyo HVAC is a well-known tech company that’s been in business since the early 1900’s, offering heating and cooling solutions for over 40 years. The company specializes in heat pumps and air conditioning and offers highly technical units that can be remotely controlled and matched with advanced scheduling features. Sanyo HVAC sells heating and cooling solutions for residential and commercial purposes. Most of Sanyo’s equipment relies on highly efficient heat pumps, thought it also offers cooling units which rely on a compressor. The units are highly efficient and come in a variety of form-factors for use in different spaces. The Sanyo HVAC Mini Split Air Conditioning system and ductless AC units rely on energy efficient heat pumps to heat and cool. Sanyo units are sized for residential and commercial units. They provide cooling and heating between 9,000 BTU’s and 42,000 BTUs an hour. The wide range of power allows the units to work effectively in different sized rooms. 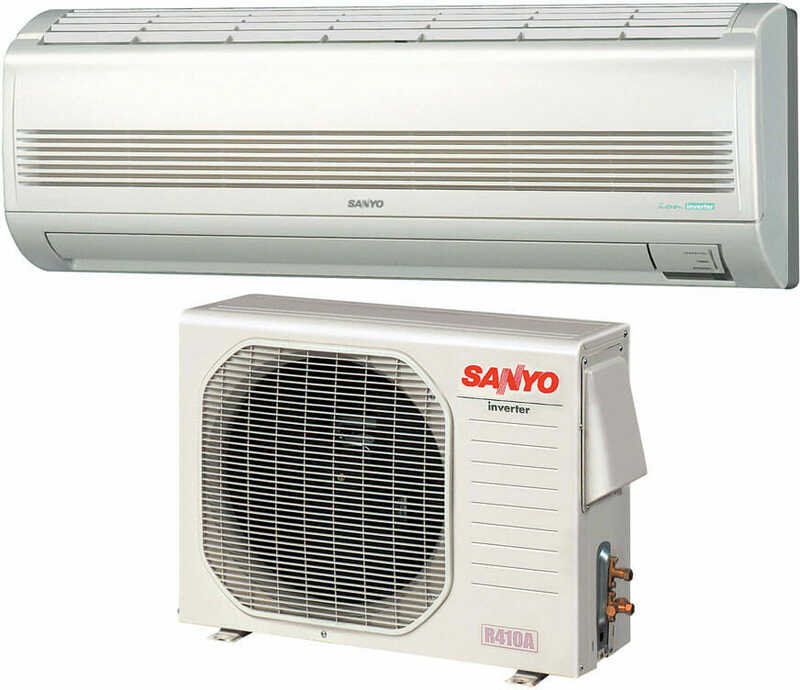 While the majority of Sanyo’s heat pumps are ductless HVAC systems, some of the larger equipment is designed to connect up to central ducts. These systems are more effective at heating and cooling multiple rooms of a building. While they experience more heat loss during operation, they are often preferred over having separate units in each of the spaces in a large office building or even a smaller residential setting. Sanyo makes a recessed ceiling unit designed to blend right in with the surrounding environment. Once installed a recessed unit looks like a furnace grate and is unobtrusive compared to other heating and cooling solutions offered. Sanyo equipment stands out by being some of the quietest and most efficient on the market. The air conditioners and heat pumps come with remote controls, and highly programmable interfaces. Sanyo heat pumps and air conditioners stand out from conventional models through their use of a twin rotary compressor versus the standard single cylinder compressor. The twin rotary unit is more balanced and creates less vibration overall, resulting in quieter operation compared to other brands on the market. By switching to R-410A refrigerant, Sanyo boosted the efficiency of all its equipment. All units now offers a minimum efficiency of 13 SEER. The improved refrigerant isn’t the only way that Sanyo’s units are energy efficient. They also have an adjustable capacity so that just enough heating or cooling power is utilized to meet needs. When your home only needs to be heated slightly, a unit will operate at 25% capacity or even less to achieve the heat adjustment. By running at a lower power level, the equipment saves energy overall. Sanyo equipment comes with remotes designed for wireless operation. The units are designed to integrate with standard infrared controllers and can be manipulated from around the room. Some cooling units have to be drained on a regular basis to allow them to operate properly, that’s because water is pulled from the air during the heating and cooling cycle. Sanyo units come with a built-in drain pump that automatically pumps out all the built up water to keep it from causing problems. This allows the equipment to operate nearly continuously and it doesn’t suffer from moisture buildup because water is pumped away through a drain line. In some climates where temperatures fluctuate between early morning and midday it’s important to have both cooling and heating functions available. Sanyo heat pumps switch between cooling and heating as needed throughout the day to maintain the desired temperature. Whether you need a heating or cooling solution Sanyo has quality equipment to meet the need. The equipment is energy efficient, versatile, and designed to be easy to control.